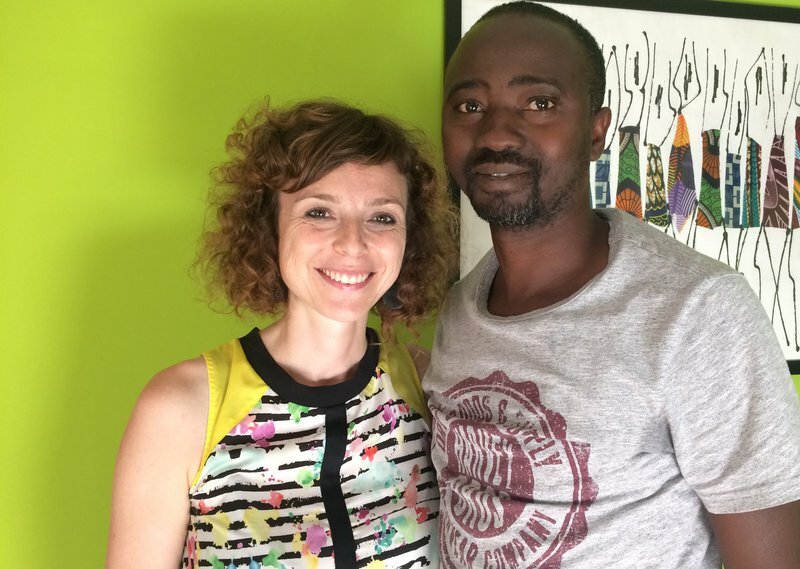 Núria and Amadou: A SUCCESSFUL EXAMPLE OF A LANGUAGE PAIRING IN THE MENTORING PROGRAMME J. LARIOS. One of the main obstacles when adapting to a new country is coping with the local language. While it is not impossible for many people to manage to get by using only a “common” language, such as English, that has its limits, and in the long run it is not really feasible. That is why most people make efforts to learn the local language, and in Catalonia the Voluntariat per la Llengua language mentoring programme is an excellent option for newcomers. The scheme, promoted by the culture department, is now 15 years old and has proven to be a great success: since 2003, some 125,000 language pairs have been using the system to learn and teach Catalan. The idea is to facilitate spaces for conversation between people who have basic notions of Catalan and seek to practice it in order to acquire fluidity with others who are either native or fluent speakers. It is a very simple system. The programme puts a student in contact with a volunteer for an hour a week over 10 weeks, depending on their availability, and it is often used as a complement for people who are also learning Catalan in formal education. “Adults who do not have Catalan as a common language do not always have the right environment to develop their skills, because their immediate circle is not used to it,” say the coordinators. For this reason, the language partner allows for practising in a relaxed environment, which can help the learner to acquire the confidence and security they need in order to incorporate Catalan into their daily work and personal life, and in social relations, without other people having to change to another language. Because couples can talk about any subject they want, the initiative helps bring the learner closer to the realities of Catalan society, while encouraging the exchange of information on cultures and traditions and, in many cases, creating lasting friendships. Year after year, the number of people interested in volunteering increases. In 2017, for the ninth consecutive year, the programme registered 10,000 language pairs. There is no shortage of interest and applicants almost always exceed the number of volunteers available at any one time. Last year, some 11,066 people participated in the programme, and 6,185 registered for the first time: some 4,277 were learners and 1,908, volunteers. That is why the involvement of volunteers is key, and in many cases there are people who offered to help more than one learner, thereby reaching as many of the growing numbers in need of language development as possible. One of the most pleasing aspects of the programme is that it is not uncommon for a learner to eventually move on to become a volunteer themselves and therefore helping other people trying to learn Catalan while sharing their knowledge. The reasons people volunteer are varied and few are turned away. What is needed? You just need to be of legal age, have mastery of Catalan, and to have a free hour per week. Not all those who would like to help can find the available time, so last year a change was made that allows for on-line pairing. What’s more, as mentioned, a number of people who have benefited as learners have moved on to become volunteers. Volunteers come from all walks of life. Some time ago, former Catalan president, Jordi Pujol, participated as a partner for a learner from Argentina. Most of the learners are in fact from Latin American countries, and there are also many who come from other parts of Spain. The social aspect of the Voluntariat per la Llengua project shouldn’t be ignored. Newcomers often believe adapting to a culture takes time and that it is more easily done from within their own cultural groups living in their adopted homeland, but VPLl can be the first opportunity for them to make real contact with the local community and from there, make valuable contacts that will help them become more confident in the cultural environment. Making friends is more than common in the programme and on the right we have an extreme example with Núria and Amadou who ended up getting married.